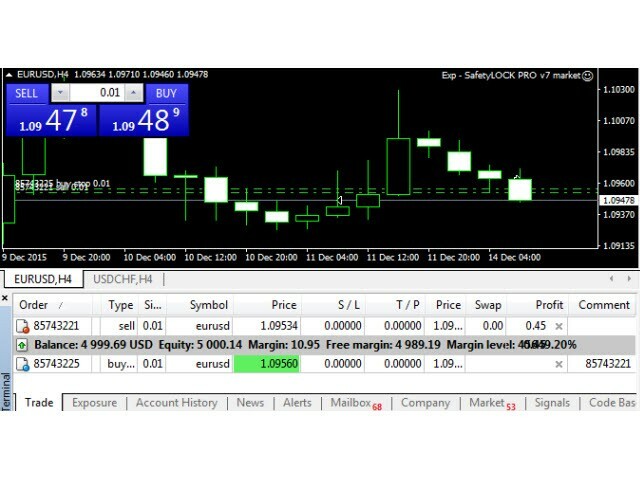 SAFETYLOCK allows traders to avoid strong market reversals by setting an opposite order for an already opened position. If a trader or an EA opens a position, SAFETYLOCK opens an opposite pending order for it. If the position becomes loss-making, the pending order is activated creating a lock. The EA allows you to close the initial position, work with a trailing stop, or multiply the lot. You can also modify the pending order Open price following the position price. MilliSecondsTimerForMonitoring - the duration of algorithm execution, in milliseconds (default is 1000 = 1 second). SymbolMonitoring - SymbolMonitoring = ALL_SYMBOL = monitoring all symbols and all trades on the account. If you launch the Expert Advisor on any currency pair chart, it will monitor all currency pairs. Type_Monitoring - the type of trades for the EA to monitor, BUY SELL or ALL. Magic_Monitoring - the magic number of positions for the EA to monitor, you can specify multiple values separated by commas. Comment_Monitoring - this option filters trades for opening a locking position based on the Comment_Monitoring. Min_Lot_Monitoring - the minimum lot for the EA to monitor, the parameter is disabled if set to 0. Max_Lot_Monitoring - the maximum lot for the EA to monitor, the parameter is disabled if set to 0. SafetyPosMonitoring - enable monitoring of positions opened by the SafetyLock Expert Advisor. StopLosse - stop loss for SafetyLock pending orders. TakeProfite - take profit for SafetyLock pending orders. MNLOT - lot multiplier for pending orders. StopOrderDeltaifUSEe - the distance for SafetyLock pending orders. NumberofStopOrder - the number of SafetyLock pending orders per position. DistancefromStopOrders - the step of the order grid in points if you use NumberofStopOrder. ModifyOrdPend - enable pending order price modification based on the price movement. If enabled, pending orders will follow the price. ModifyOrdPend_STEP - order price modification step in pips. ReopenClosedSafetyOrders - reopen SafetyLock pending orders that were closed by a stop loss, if the locked position is still open. Close_One_if_Safety_Closed_In_Profit - close the original position if the SafetyLock position was closed with profit covering the current loss of the original position. Close_One_if_Safety_More_profitable - close the original position if the profitable SafetyLock position covers the current loss of the original position. CloseOneifStopsActive - close the position if the SafetyLock pending order triggers. Once a pending order triggers and turns into a position, the main position will be closed if this option is enabled. CloseSafetyPositionsifclosed - close SafetyLock activated positions after closing the main position. Remove_TAKEPROFIT_ofOriginalifStopsActive - delete the take profit of the original position upon the activation of the SafetyLock pending order. Remove_STOPLOSS_ofOriginalifStopsActive - delete the stop loss of the original position upon the activation of the SafetyLock pending order. TrailingStopUSE - enable trailing stop of SAFETYLOCK PRO positions. The trailing stop will only be activated for positions that triggered and were opened by the EA. IfProfTrail - trailing stop will only be enabled after the position reaches the TrailingStop number of points. If you disable this option the EA will enable the trailing stop function immediately after the position reaches +0 profit points. In this case the first stop loss is set in the losing zone. TrailingStart - the number of profit points to activate the trailing stop function. TrailingStop - distance in points from the current price to the set stop loss. If the current profit is 200 points, and TrailingStop = 100, then stop loss will be set at +100 points. Thus, we allow the price to move back to a maximum of 100 points. Otherwise the stop loss will trigger and the position will be closed at +100 points. TrailingStep - stop loss modification step in the trailing stop function. MovingInWLUSE - enable the breakeven function. The function modifies the stop loss level by LevelWLoss points once the position reaches the LevelProfit number of profit points. LevelWLoss - the level to set stop loss in the profit area, in points. LevelProfit - the number of profit points that the position must pass in order for the breakeven function to modify the stop loss. SetMinStops - automatically normalizes all parameters in points to the lowest stop level allowed on the server. Magic - the magic number of the EA's pending orders. Slippage - maximum allowable price slippage in points when opening and closing positions. MarketWatch - allows opening positions with the stop loss/take profit on accounts with the MARKET execution. First a position is opened; then, after a successful opening, the stop loss and take profit levels are modified. The same good words for an excellent developer! This EA is excellent, it can really save and protect the trade. However, sometimes the recovery zone will have problem in range market. may I request a parameter that can control the Max Hedge Cycle? Safety Lock is great, but sometimes the swing market will cause unlimited hedging orders and big max drawdown. I hope the hedging order number is under control. For example, if I set Max 3 Hedge orders, the original position is buy, then there will be max sell, buy, sell, no more. After that, Safety Lock will disable the pending order function. Is it possible to add this in next update? Safety Lock will become perfect if this para is included. Thanks in advance. Amazing product with all the features you will ever need and many more. It's a very reasonable price for such a useful and adaptable utility. Very good EA and developer is very supportive of his client base. Отличная машинка в умелых руках. Bought it but still have many questiion. Good and Very useful EA. Author is nice and helpful, willing to update the EA in time. The author keeps reviewing and fixing any reported bugs in only a few days. Good EA. Very good quality, safety lock installed and you can even hibernate like a bear, there will be no stop out. This EA can be useful for creating locked hedges. If you take a partial take profit of the original position before the safety position activates, the EA closes the old safety position and replaces it with a new one having the adjusted lot size. Good EA when compared to other costly EA. Thrust me nothing can protect you better than this product. Every traders must have protection like this manuel or Auto not important everybody or every EA can make wrong chose. false - continue to modify the opening price of pending orders by price movement. The functions Close_One_if_Safety_More_profitable and Close_One_if_Safety_Closed_In_Profit have been updated. When using NumberofStopOrder> 1, the profit of SafetyLock positions is calculated from the amount of the profit of all positions according to the ticket of the main position. The function Close_One_if_Safety_More_profitable is imenen. To get the results of previous versions, set Close_One_if_Safety_More_profitable_Dollars = 0. The function Close_One_if_Safety_Closed_In_Profit is changed. Now the closing of the main position occurs only when the amount of profit of the closed positions SAFETYLOCK and the main position is greater than or equal to Close_One_if_Safety_Closed_In_Profit_Dollars. All orders and positions of SAFETYLOCK are closed. The profit amount of SAFETYLOCK must be greater than or equal to Close_One_if_Safety_More_profitable_Dollars + Close_One_if_Safety_Closed_In_Profit_Dollars., Than the main position. If the position SAFETYLOCK was closed for any reason (manual close, takeprofit, trailing stop), then the main position will also be closed. StopOrderDeltaifReopens - The distance to set the pending order SAFETYLOCK after reopening the order. The price for setting a pending order will be calculated from the current price. - If the SPECIFID_Symbol_Monitoring parameter is not set and SymbolMonitoring = SPECIFID_SYMBOLs, then the EA monitors the currency pair it is attached to. - Changed the conditions for closing Safety positions, if they are more profitable. Fixed an error than caused repeated modification of stop loss/take profit of the original position. Updated the timer function. In case the timer does not start, the EA operates based on ticks. Fixed an error related to the list of magic numbers. SPECIFID_Symbol_Monitoring - added the ability to create a comma-separated list of symbols to be monitored. 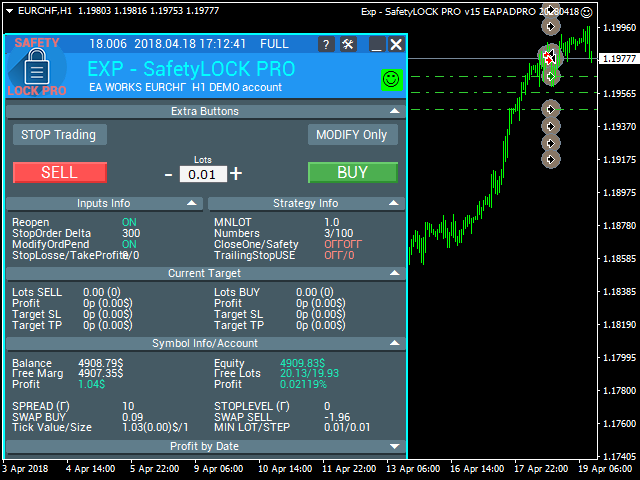 - Added the Close_One_if_Safety_Closed_In_Profit parameter, which closes the original position, if the Safety position was closed in profit covering the current loss of the original position. As soon as the LOCK triggers and the Safety position closes by take profit, the original position will be closed. - Added the Close_One_if_Safety_More_profitable parameter, which closes the original position, if the Safety position is more profitable, covering the current loss of the original position. As soon as the LOCK triggers and the Safety position is more profitable, both the Safety and the original positions will be closed. - The Magic_Monitoring parameter has been updated. It is now possible to specify a list of magic numbers (separated by a comma) to be monitored. - Fixed the error with placing pending orders on their positions when the SafetyPosMonitoring is enabled and more than 1 position in different directions are present in the market. - Fixed the error with Magic_Monitoring, when setting a Magic_Monitoring value other than "-1"
It allows to "hard" lock two positions by removing the stop loss and take profit. It creates a "safe lock", which will not be unlocked if the original position was closed by its stop loss or take profit. Close SAFETY positions that have been activated, if the main position was closed. ReopenClosedSafetyOrders - reopen the 'Safety' pending orders, if they were closed by a stop order, while the protected position is still open. NumberofStopOrder - the number of pending orders placed for a position.